Virgin coconut oil is an amazing natural oil with a myriad of uses and benefits. It contains up to 57% lauric acid, a substance found in breast milk. It has lots of health benefits when consumed, but it is also a beauty essential that can be used in many different ways. I always think that whatever you put on your skin ends up in your system, so what could be safer to use than things that are safe to eat? Virgin coconut oil is a white solid at room temperature, but melts at only slightly higher temperatures (a bit like butter). It has a delicious coconutty smell. Use organic fair trade oil if you can as it’s better for the growers and the environment as well as your skin. Here are my top tips for getting the most out of this amazing substance. I suffer from eczema and very dry skin and have tried nearly every moisturiser under the sun, but nothing leaves my skin feeling as beautifully soft as coconut oil. Applying it directly to inflamed patches of eczema is not recommended as it may irritate it more, but once you’ve got your eczema under control it can be used to keep your skin highly moisturised to help prevent future flare ups. To apply, break off a large chunk and run in lines all over your body – then rub in gently. As well as having moisturising qualities, coconut oil is also anti-bacterial and anti-fungal, making it ideal for skin conditions that may get infected, such as eczema. I find that traditional, thick and greasy lip balms often make me lick my lips more, which makes sore, flaky lips worse. Because the consistency of melted coconut oil is much runnier and quite slick it does not have this effect, and leaves your lips lovely and soft. I take a little screw top pot (either an old lip balm pot or a travel sized pot like you can buy in chemists) and push in lots of the solid coconut oil until it’s packed in. You can then apply the oil as you would normal lip balm, as the heat from your finger will melt it – or you can dig a little bit out with a nail and let it melt on your lips. Since using the oil on my lips I have not suffered from any cold sores, which I used to be quite prone to. If you have sensitive skin, soap based shaving creams and gels will only aggravate your problem. A natural oil is a skin-friendly alternative. Blended coconut oil that stays in liquid form at room temperature is easiest to use in the bath or shower, but if you have the solid version, simply leave the sealed container under the hot shower for a bit and you will soon have enough melted liquid to apply. Rub all over your legs (or anywhere else you are shaving) then shave as usual. You will find that the razor glides smoothly over your skin with the lubrication of the oil, leaving you with a really clean shave and beautifully moisturised skin too. If you suffer from dandruff, cradle cap or seborrhoeic dermatitis, you will know that it’s really hard to find a shampoo that shifts it properly. Try virgin coconut oil as an effective natural remedy. Melt some oil and rub it gently into your scalp all over. Leave for a few hours or overnight, laying a towel down on your pillow to protect your bedding. Then shampoo out. You may need to shampoo and rinse twice, paying attention to the ends of your hair, as well as your scalp, to remove all traces of the oil. If you have bad seborrhoeic dermatitis, try mixing a few drops of tea tree oil in with your coconut oil, but try to keep your hair off your skin as the tea tree oil may irritate it. If you have long hair you may wish to plait your hair overnight to keep it off your shoulders. Luckily, coconut oil is not just good for your scalp, it’s great for conditioning your hair too, but as described above you do need to take care to wash all traces of the oil out. If you give up using shop-bought chemical conditioners, you may be surprised at how good your hair can look without any conditioner at all. If you find your hair is a little dry, fluffy or flyaway as a result, a tiny amount of coconut oil can be the solution. Rub some oil into your hands as if you are trying to moisturise your hands so that it’s pretty much all rubbed in. Then pull your fingers through your hair to add moisture and run your hands over the tops of your hair to smooth and shine. Focus on the outer surface and the ends rather than the scalp. You can do this whilst you are drying your hair, or use it like a finishing serum after drying. Don’t spend a fortune on expensive sensitive skin make-up removers or use petroleum based products. All you need is a little coconut oil and some cotton wool pads. Melt a little coconut oil on your finger tips and gently apply to your face, around your eyes and eyelashes. 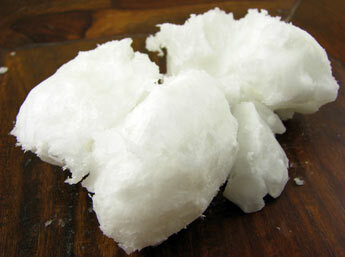 Then take a slightly damp cotton wool pad and wipe away the coconut oil – and your make-up along with it! You may need to repeat the process to get rid of all your eye make-up, but your skin will be beautifully moisturised afterwards too. I buy Tiana brand coconut oil from Nutri Centre. What brand of oil do you use and where do you buy it from? I found this post after searching for why my son's eczema seemed to get worse after using coconut oil. When I applied it, it was already very irritated and he had scratched it until it bled. I was worried he might be allergic, so thank you for clearing that up for me. You might also want to try emu oil. It has amazing moisturizing and conditioning properties, and I've seen it work after only one application. I ran out which is why I was using the coconut oil.